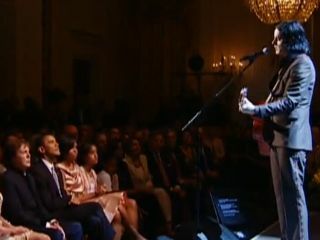 Jack White plays for Obama and McCartney...no pressure there! Jack White has faced some strange and tough crowds in his relatively brief career, but when he performed The Beatles' Mother Nature's Son on acoustic guitar at the White House recently - with President Obama and Paul McCartney looking on from a few feet away - well, let's just say every gig from here on in should be a cinch. White (who deftly threw in a little bit of That Would Be Something, a gem from Macca's first solo album) was one of the many artists on hand at last month's Library of Congress Gershwin Prize event honoring McCartney. Other celebs in attendance included Stevie Wonder, Elvis Costello, Paul Simon, Herbie Hancock, Dave Grohl, Emmylou Harris, Faith Hill, Jerry Seinfeld, the Jonas Brothers (they rank with the Obama girls) and way too many star-struck Congress-folk to count. The evening concluded with a McCartney-led sing-along of Hey Jude (see below), during which even the Commander-In-Chief joined in. The event will air on PBS on July 28 in the US.